The 10-year treasury yield is unlikely to rise in 2019. Inflation is expected to remain low. We predict weak economic growth for 2019. The Fed Funds rate will remain stable. Sell put options on the 10-year Treasury note. Our projections indicate the 10-year treasury yield is unlikely to rise in 2019. 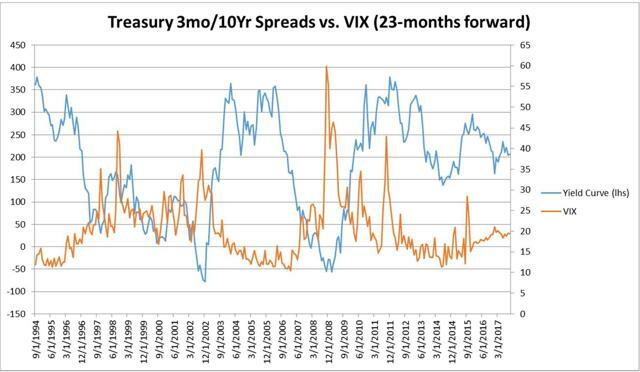 We recommend selling 10-year Treasury put options to exploit this interest rate environment. Our projection is based on future inflation expectations, the Fed's monetary policy, and economic conditions. These factors are important because they directly impact the 10-year Treasury yield. Increases in inflation are directly correlated with yield because increased inflation raises investors' expectations of compensation. Similarly, the Fed funds rate indirectly influences the 10-year yield since an increase in the Fed funds rate increases all rates in the economy. Lastly, weak economic conditions drive down the 10-year yield. If investors have a pessimistic outlook on economic growth, demand for bonds increases; this raises the price of bonds and decreases the yield. 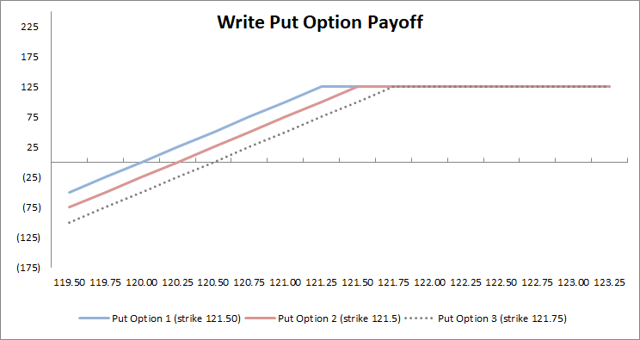 Selling put options is a lesser understood investment strategy, but is not complicated. Buying put options on Treasuries typically acts as insurance against rising interest rates. This can be helpful for hedging interest rate risk when rates are expected to go up. Our recommendation is to do the opposite as we project interest rates will remain relatively unchanged. In place of buying put options, you sell put options and collect the premium paid by the purchaser. This strategy works best when yields are stagnant or decreasing because you continue to collect the premium as long as prices do not fall below the strike price. Bond prices and yields move in inverse directions, so if the yield does not increase (thus driving down bond price), the premium can be collected. If yields were expected to decrease significantly, a long position in bonds would better take advantage of the increasing bond price. The graph below depicts the investment strategy with three separate strike prices. As long as rates do not increase, the premium can continue to be collected. 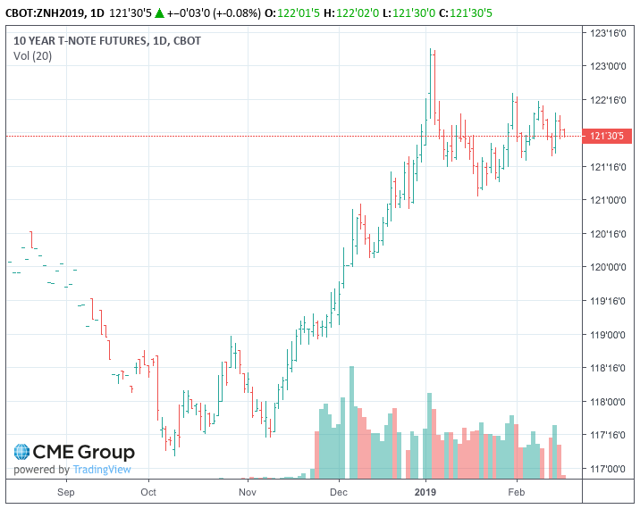 The second chart from CME group shows that put prices have continued to climb since October 2018. This indicates selling a put option would have allowed the investor to collect a premium throughout that period. We project that inflation will hold at its current level. There are several offsetting factors that should ultimately result in little change to inflation. Economic volatility in the financial markets and international relations lowered investors' expectations about economic conditions. The real-estate industry, most staple commodities, and the retail sector are impacted by volatility in the stock market and global commerce. Many large companies in the U.S. reported declining revenue for the fourth quarter of 2018. This reflects a decline in purchases which further results in a decrease in inflation. However, recent tax cuts and economic growth would seem to support an increase in inflation. The dovish statement from the Federal Reserve ended the expectation for constrictive monetary policy and drove up asset prices in the market. Additionally, increased wages and an increase in rising real income provided space for an increase in inflation that would not be limited by wage pressure. Lastly, the Treasury Department sells debt in exchange for cash that it uses to finance government operations. A large deficit caused the government to increase borrowing last year after the $1.5 trillion tax cut and an agreement to increase government spending by $300 billion over the next two years. This should stop further increases in inflation. Considering all of these offsetting factors, we project inflation will stay at its current level. The Fed has targeted an inflation rate of two percent to maintain economic growth and prices. As the exhibit of the PCE index shows below, the inflation rate fluctuates around 2% in the past few decades, and we expect to hold at this level in the near future. The U.S. economy achieved stronger growth than expected in 2018, but economists believe this growth is due to short-term stimulus measures. We project U.S. economic growth will slow significantly in 2019 as the impact from government stimulus measures declines, uncertainty of monetary and fiscal policies continues, and the U.S. experiences negative impacts from trade frictions. Large-scale tax cuts have been introduced for more than a year, and its boosting impact on the economy has gradually weakened. At the same time, its stimulating effect on corporate investment has not met expectations. Most companies are more likely to repurchase their shares after tax cuts rather than make large-scale fixed-asset investments. On the other hand, as the U.S. government's fiscal situation deteriorates, the degree of stimulus to the economy through fiscal policy is decreasing. Projects from Congress show tax cuts in the next decade will increase the federal government's fiscal deficit by $1.46 trillion. Former U.S. Treasury Secretary Lawrence Summers believes the increase in fiscal deficit will limit the government's investments in infrastructure, human resources and technology, and will not help economic growth in the United States. The slowdown in U.S. and global economic growth means U.S. Treasury yields will not raise further. Second, it is generally believed that investors' demand for 10-year U.S. debt reflects their demand for low-risk or safe assets. The fluctuation in rates of return also depends on investor's appetite for risk. We can use the Chicago Board Options Exchange Volatility Index (VIX Index) to reflect investor risk preference in the U.S. market. The relationship between the VIX index and the rate of return is approximately as follows: VIX raises → uneasiness raises → demand for safe haven (U.S. debt) increases → U.S. bond prices rise → U.S. bond yields fall. In December 2018, the VIX suddenly increased to around 25, then fell back to 15 in January 2019 and has remained relatively stable until now. At the same time, the U.S.-China trade war should have a temporary resolution by spring. Under these conditions we believe that investors' risk preferences will not change substantially. In other words, investors' demand for U.S. Treasury bonds will not drop significantly, so the 10-year yield will hold at its current level. Finally, since November 2018, the 10-year yield fell more than 60 basis points in 2 months. Analysts changed their forecast for rising yields due to deteriorating data, lackluster investor sentiment, and tighter financial conditions. This has drawn questions over the ability of central banks to normalize monetary policy without causing an economic downturn. This is why we recommend selling put options. After the January FOMC meeting, the Federal Reserve signaled it will not raise interest rates in the near future. The Fed Chairman would not specifically address a decrease in the Fed rate, so we can assume it will hold steady for the foreseeable future. This is a very strong indicator that the yield on the 10-year Treasury note will not raise. A steady yield curve means bond prices will remain largely unchanged (bond prices and yields move in opposite directions). Functionally, the Fed impacts interest rates in two ways: by changing the federal funds rate, and by increasing or decreasing the size of the Federal Reserve Bank's balance sheet. An increase to the federal funds rate increases all interest rates and the yield on all Treasuries (including the 10-year), while changing the size of the balance sheet impacts the supply of money and helps boost the economy in general. The Fed uses both methods to enact monetary policy based on economic performance. In times of economic downturn, the Fed attempts to keep rates low to encourage economic growth, whereas the Fed will increase rates and decrease the balance sheet when the economy is performing well. The Fed does this to carry out one of its mandates, to keep prices stable. The Fed announcing it will not raise interest rates signals there is some uncertainty in the market and that yields on 10-year treasuries will not increase. Further, the Fed's January statement that they will be flexible in reducing the balance sheet implies there will be less upward pressure on long-term rates as the supply of money will remain relatively high. The FOMC announcement to not increase rates was expected given the current economic climate. There is uncertainty in the market, and investors are worried about another recession. Our investment strategy exploits the current interest rates by betting against an increase in rates while accounting for the possibility that rates go down. The strategy earns money from the Fed not raising rates and not reducing the balance sheet.